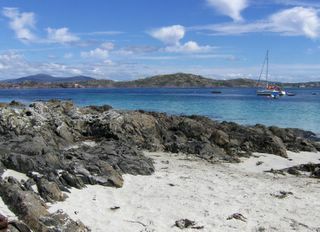 Scene from our picnic spot at Martyrs Bay, Iona. The colour of the water there is just beautiful, as Heather says. Bright shades of blue and turquoise above that lovely pale sand. After the picnic we went in for a swim. Real swim, goggles and all. J swam out to the boats. The real reason I came back in after a while was because I could feel my skin getting too much sun. It wasn't the *bracing* water. No really, I was starting to get used to that. A bit. Wow - it looks almost tropical! Beautiful photo! Thanks so much for sharing. Don't you just love the West Coast of Scotland when the sun shines - there's no better place in the world. I went swimming off the cost of Gigha last September at the same time that a friend spent thousands on a holiday to the Seychelles and I bet I had the better swim! !